In November 1998, a double homicide occurs at the newly constructed Ogawa apartment complex in the heart of Mifune City. The murderer, Tomoe Enjou, has fled in a panic. To his astonishment, he is not pursued by the police and news of the incident has not been reported through media outlets. After Shiki Ryougi defends Tomoe from a group of thugs, she allows him to use her residence as a hideout. However, a few days later, Tomoe is shaken to discover that his mother is alive, even though he is convinced that he killed her. Coincidentally, Mikiya Kokutou is investigating a tip that his associate Touko Aozaki receives regarding the murder at the unique apartment complex. As he uncovers more information about the incident, Mikiya takes a particular interest in Tomoe. Deciding to investigate him further, Mikiya soon discovers the disturbing truth of the foreboding Ogawa complex. 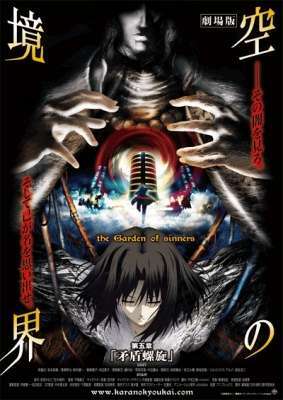 The fifth installment of the Kara no Kyoukai film series, Mujun Rasen combines an intricately constructed mystery with established themes and characters to produce a dark, thought-provoking story.